Six Democrats hoping to be the state's next governor squared off in a debate live on NBC Connecticut Friday night. Six Democrats hoping to be the state's next governor squared off in a debate live on NBC Connecticut Friday night, however there were just five candidates in the studio as the broadcast began. Greenwich businessman Ned Lamont was not at his podium at the top of the debate, the victim of Connecticut's notorious traffic. It was a point he didn't let go unnoticed when he finally did join his fellow Democrats. "I hope at some point you ask me about transportation, because I'm loaded for bear on that now", Lamont said to NBC Connecticut moderator Tom Monahan. Making up the rest of the debate field were Former Stamford Mayor Dan Malloy, Simsbury First Selectwoman Mary Glassman, former State Representative Juan Figueroa, Ridgefield First Selectman Rudy Marconi and Waterbury Mayor Michael Jarjura. 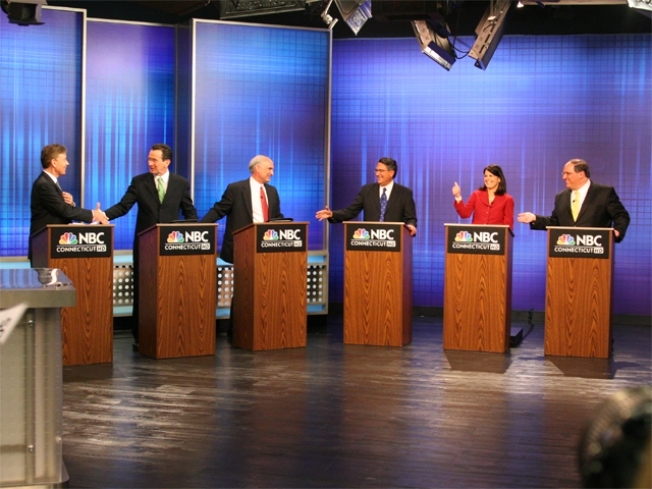 The focus of the debate moved to the state's fiscal crisis, including their stances on the so-called millionaires' tax, spending cuts, and even the prospect of bringing tolls back to Connecticut. The candidates didn't disagree on much. Most believing raising taxes on anyone in the state shouldn't be the first option, instead looking for areas to cut spending. The candidates were almost all in agreement on ensuring that workers receive paid sick days, a stance that many Republicans consider anti-business.